While it is not uncommon for online casinos to pick a game of their choice now and then and offer players double comp points in order to try out that specific title, it is not often that players are offered TRIPLE comp points on certain games. However, Majestic Slots Online Casino has given players a very good reason to play the fun Coyote Cash online video slot game this month because the rewards are great. Players are invited to enjoy triple comp points all month long simply by playing Coyote Cash slot game. Throughout April, players can earn triple comp points per spin when they play the game. As such, instead of the usual two points per spin, players earn three! The promotion period will run until Thursday, April 30th, giving players ample time to get in some great spinning action on this game. 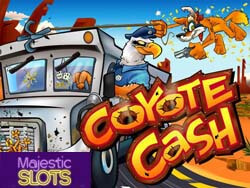 Coyote Cash is a funny, animated slot game by Realtime Gaming software group with a Western theme. The game features images such as the Sheriff, the Snake and the cash van, and has 25 pay lines. One of the main attractions of Coyote Cash slot (besides its entertaining theme) is the fact that it carries a progressive jackpot which can be won at random by lucky players. Betting ranges are comfortable, and high rollers will love the challenge of being able to play a maximum of 25 lines. The wild symbol in Coyote Cash slot is the Coyote himself, which substitutes for most other symbols in the game to create winning combinations with prizes automatically doubled. If three or more scatter Loots symbols appear, they activate the free game feature. 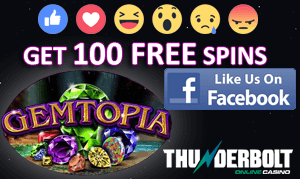 Players are rewarded with 20 free spins with a multiplier of up to 4 x their bet. At any time during the game, players can hit the progressive jackpot and win life-changing sums of money.